The article below helps you understand the payment policy and net-terms for contractors who work for CopyPress. What is the net-90 payment policy? Using net payment terms is a common payment-issuing practice for business contracts. It's an agreement by which payment is issued at some future date (either upon receipt of an invoice or completion of work). CopyPress has a net-90 payment policy. Our net-90 payment policy means that contractors can expect to receive payment approximately 90 days after the week an assignment was submitted. Your work is not considered complete until it has been client approved, and you may receive revision requests after you submit. For example, if you submitted work on Monday, January 1, 2019 you will be paid approximately 90-days from Friday, January 4, 2019. The 90-day window starts from the Friday of the week you submit an assignment. Contractors will have an assignment due date when they take on a project. This is clearly outlined in the assignment details. When you submit an assignment, it will then be reviewed and ultimately, approved. Work is not "approved" until it has been reviewed and signed-off by the client. This can take up to 30 days from the date you submit. You can track the date that your work is completed inside the assignment window. See the example below. This article was "completed" or approved on March 20, 2018. This assignment will be paid roughly 90 days from that date or June 20, 2018. Why do we have a net-90 payment policy? The 90-day payment window for contractor work is a policy that protects CopyPress and its contractors. Clients have 30 days from the time work is submitted to request a revision. If we paid for work prior to it being client-approved, we'd face issues ordering revisions. Additionally, clients typically pay CopyPress on net-terms, which means we receive payment from clients sometime after work is approved. The 90-day window ensures that the work is client-approved and we've received payment from the client for the completed assignment. When will I be paid for work? Payments are sent during two windows of each month (buckets) in various batches — either the first half (1st-15th) or the second half (16th-end of the month). When your assignment is approved, you'll be added to a pay period, which you can find in your user account. Our format is such that you'll be assigned a pay bucket the month prior to when payments are issued. This will give you time to communicate any issues/discrepancies with what our records indicate for that assignment. You will also see that your payments are added to batches indicating when you can expect payments to be issued within your window. In the example above, when the assignment is approved on March 20, 2018 — it would likely be added to the 5(2) pay period. The 5(2) pay period will be paid within the window of 6/15/2018 - 6/30/2018. Where can I see my payments? You can view and track all your payments and the pay periods your work is assigned in your earnings summary window. This window shows you all of your completed tasks as well as the earnings report. You can see what has been paid or what hasn't been paid in the top right panel. Down the page, you will also see each individual assignment and a breakdown of information associated with each assignment: payment amount, the date it was processed (only after it's been processed), payment method, and pay bucket. Note: "Completed on" indicates the date you completed your task, not the date the actual assignment was approved. You'll need to refer to the Activity Log page shown above to see the assignment approval date. Will I be notified when payments are processed? What do I do if payments are late? 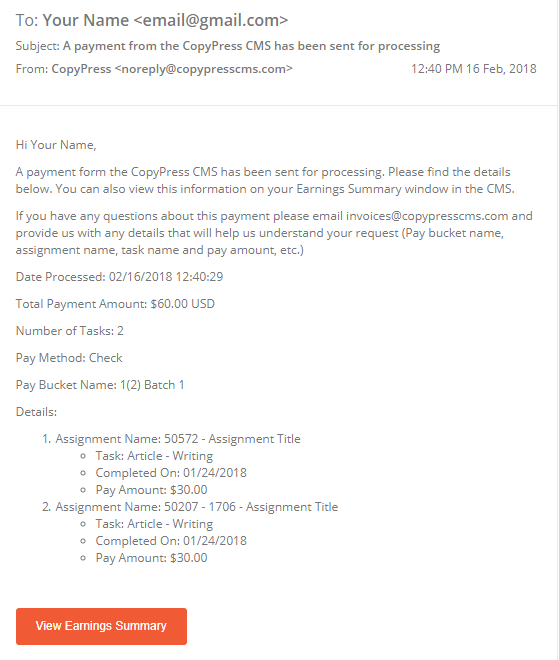 If you are assigned a pay period and you have not received notification that your payment was sent prior to your window, please contact us at payments@copypress.com. As outlined in our Terms & Conditions, in our docs, and on the multiple choice test, if your approved assignment has not exceeded the net-90 window (from the week you submitted the assignment), your payments are not considered late.